Echeveria 'Curlylocks' or sometimes called 'Curly Locks', has the most translucent seafoam green leaves tipped with a pink pinstripe. The ruffled edges look like frilly lingerie - very pretty. This is one of my favorite Echeveria, just for the pretty ruffles. The loosely arranged leaves make a very relaxed rosette, unlike some other varieties. Ultimate size of 'Curlylocks' is about 25cm (10") across with a height of 30cm (12"), but slow growing and taking several years to attain that size. Preferred conditions are bright light and fast drainage. They'll grow well in containers that can be moved indoors for the colder months as long as they can be place in a sunny window. 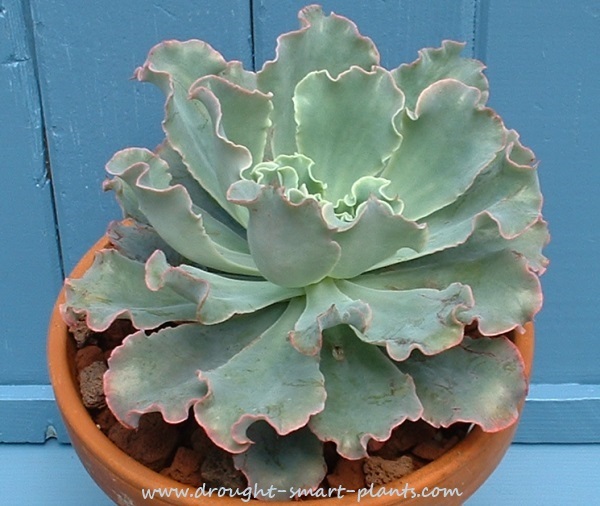 I would combine this with some of the lower growing types like Echeveria elegans and Echeveria runyonii 'Silver Onion' in a really big shallow bowl or dish garden for a stunning display for a sunny patio or deck. Propagate by leaf cuttings mostly, as they're slow to offset.